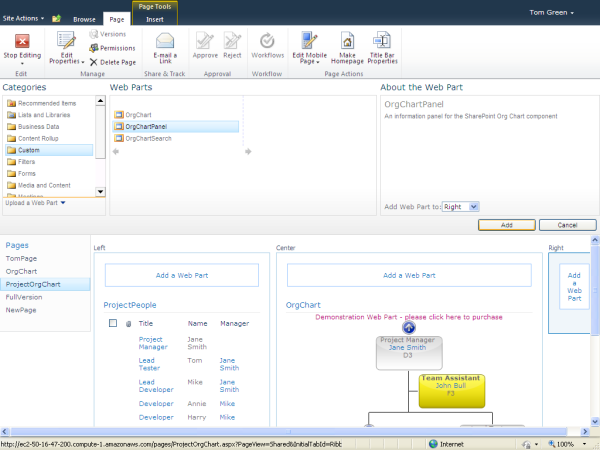 The OrgChartPanel Web Part is installed as part of the SharePoint Organisation chart package. The panel is used to display additional information and images. 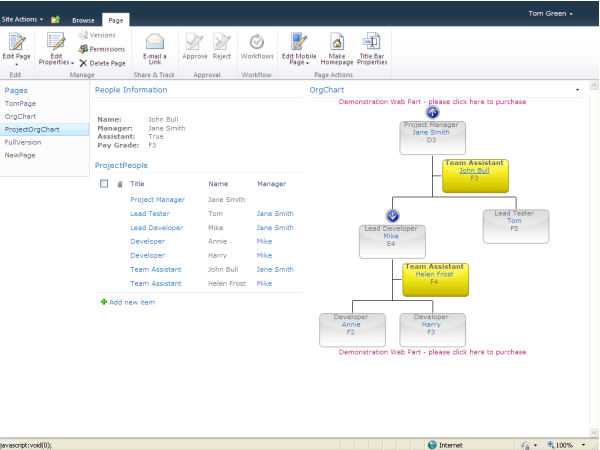 Using the panel allows people to click on the name of a person in the organisation chart and retreive additional information. Edit the current page by selecting the Edit Page option from the Site Actions menu located at the top left of the screen. Add the OrgChartPanel web part to the page. This can be located under the Custom category of web parts. 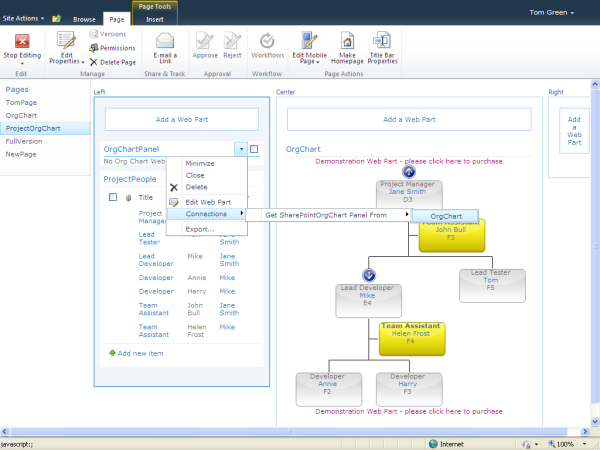 Use the Connections menu to connect the OrgChartPanel web part to the SharePoint organisation chart. If more than one Org Chart is being used on the page then select the appropriate one. By default the panel will show all the fields in your list, bar the primary key. Tick Display Primary Key if you wish to show it. To control which fields to show, list the field names into Fields to Display. They will be displayed in the order they are listed. To have complete control over the content and formatting, use the HTML Template option. This allows HTML and fields names to be mixed. Note that if you are using the Person data type in your list, then 3 extra fields are automatically generated: [fieldname]_Name, [fieldname]_Title and [fieldname]_Photo. 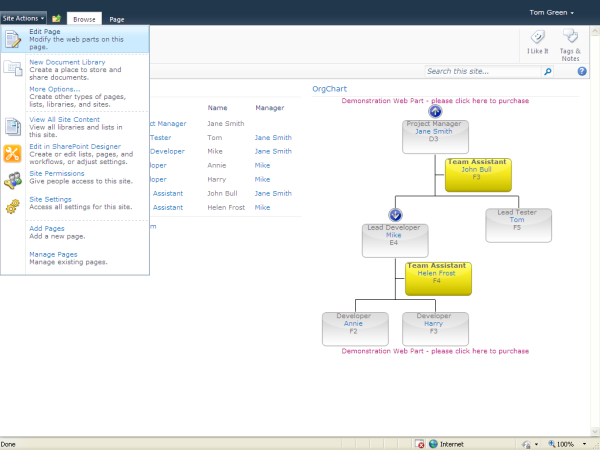 Now go to the Org Chart web part and set the Link Field in Look & Feel. This is the field that will update the Info Panel when clicked. This is usually be the person's name. 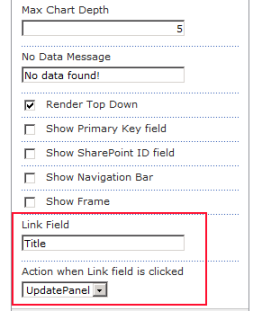 Also ensure Action when Link field is clicked is set to UpdatePanel. 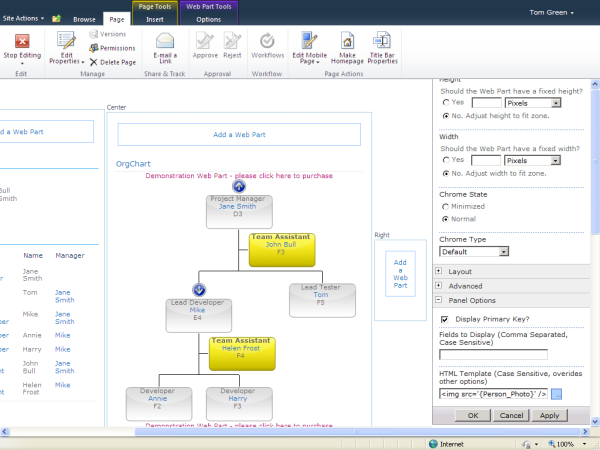 Now clicking on an item on the organisation chart will update the OrgChartPanel.